Product information "Gold-Star + Reductor (250 ml + 50 ml) - Full set"
Just mix the included reductor into the bath and the gilding bath is ready to use. The bath gilds copper, brass, bronze, nickel and silver in a very short time at a working temperature of about 90 °C. Already after a few minutes, you will have achieved a bright and visually appealing gold layer. On copper, you can achieve a red or rose gilding. The colour changes here from copper-coloured (red) to golden yellow via various red-gold shades. By stopping the heating of the bath and by taking the objects out, you can achieve these red gold shades. When gilding longer, you will always obtain yellow gold (24 carats). The bath doesn't require previous experience nor complicated equipments, although it is advisable to use the bath in a suitable receptacle (beaker) with a loose lid, for example the Tifoo basic kit for currentless plating baths. Make yourself a professional gilder! With the universal gilding bath from Tifoo. Please read our instruction manual thoroughly before buying and using this product in order to achieve perfect results for you work! Related links to "Gold-Star + Reductor (250 ml + 50 ml) - Full set"
Instruction manual for Tifoo Gold-Star + Reductor (250 ml + 50 ml) - Full set as PDF file. 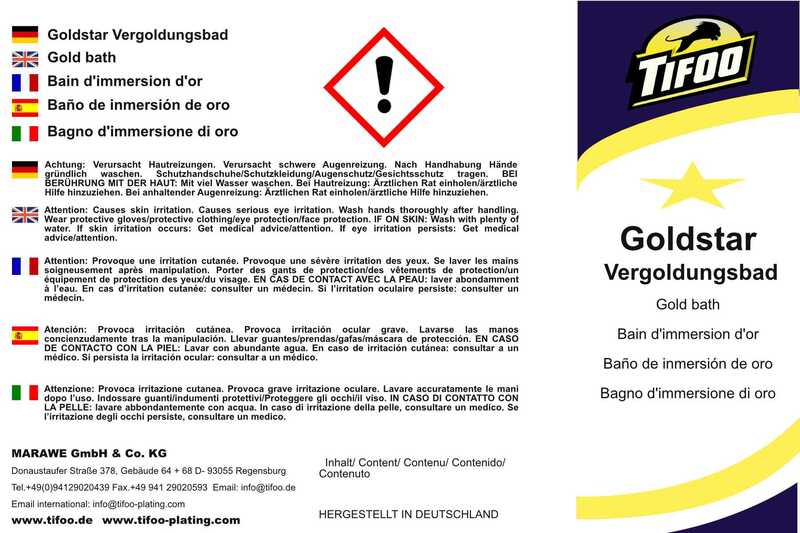 Customer evaluation for "Gold-Star + Reductor (250 ml + 50 ml) - Full set"